When it was a thousand degrees here a few weeks ago, The Pit just about came unglued. He collapsed on our bed and sulked at the general ghastliness of weather that was not only over a 100°F, but also hovering near 70% humidity. Didn't I know he was made of manly northern stock, meant for snow and ice and howling wind? I tried vainly to cheer him up, offering the coldest foods I could think of for dinner. Unfortunately, we'd already eaten all of our watermelon, and he rejected ice cream as inappropriate for a main course. Finally, I suggested trying cucumber soup. He perked up, and I went off to the kitchen to prepare said soup while he took a restorative nap. I started off with this recipe, but quickly discovered that we were missing some of the main ingredients. Erm, yes, I had in fact suggested cucumber soup without checking our actual cucumber supplies. It turned out that I had approximately one and half tiny Persian cukes in the vegetable drawer (half of one was all wilty and slimy). But cucumber soup had been promised, and so I had to improvise. 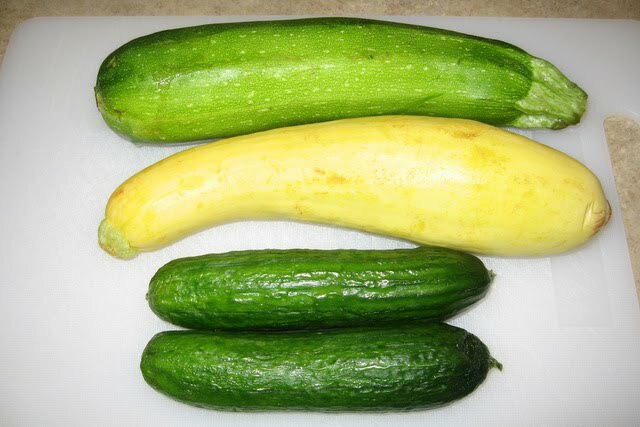 I found green and yellow zucchini originally purchased to make some pasta, and decided that cooked and blended, there wouldn't be much difference between these and cucumbers. 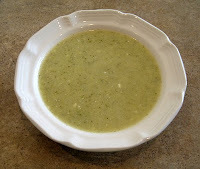 I had to make a few other substitutions (never heard of farina, had no red wine vinegar, don't keep margarine in the house, like dill better than tarragon), but the soup turned out absolutely delicious. 1) Peel and roughly chop the zucchini . 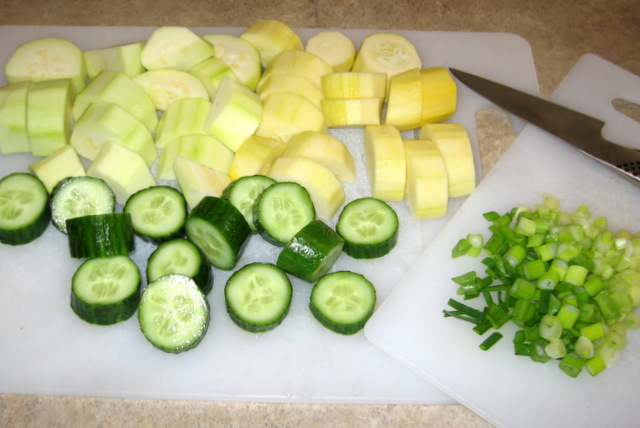 Roughly chop the cukes (peel if not using the thin-skinned Persian variety). Peel and dice the potato if using (I've now made this soup twice, once with potato and once without - as far as I could tell, it didn't make a whole lot of difference). 2) Dice the green onion. 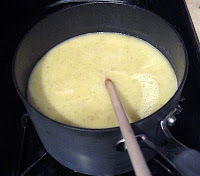 Sauté the onion in butter at the bottom of a large stockpot. 3) Add the zucchini and sauté for 2 minutes. Add the cucumbers and sauté for another minute. 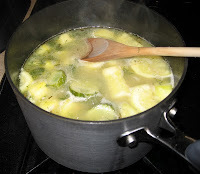 4) Add the vinegar and broth. I think part of what made the soup so good was that I used some home-made broth left over from making chicken soup, including little bits of garlic, onion, and chicken floating at the bottom. If you're using store-bought, I would suggest seasoning it a bit (salt, pepper, garlic & onion powders, thyme, rosemary, and Vegeta if you have some). 5) Put a lid on the pot and simmer for 20-30 minutes, until the zucchini (and potato if using) are soft. 6) Turn off the heat, add the dill to the pot, and use an immersion blender to puree the soup. If you're not lucky enough to have an amazing officiant at your wedding who also gave you an an immersion blender, transfer to a regular blender and puree. 7) Whisk in the sour cream. Although we originally intended to chill the soup, we ended up eating it kinda warmish, mostly because we didn't have the patience to wait for it to cool down all the way. As it turned out, this was a good decision, as The Pit had some leftovers cold the next day, and reported that the soup was better at about room temperature.